Out Board are exhibiting at Frankfurt Pro-Light & Sound in Hall 8, Stand A02, and will debut the powerful new TiMax2 SoundHub PanSpace graphical sound-effects pan programming application which works in conjunction with the S-Version TimeLine editor. Users can create multiple fully-editable pan trajectories in any Cue, which can animate multichannel audio from TiMax SoundHub’s internal hard-disk or integrate with external audio and MIDI/MTC trigger sources such as QLab. Aimed at theatre and live events sound designers plus AV, museum and attraction integrators, S-Version showcontrol functions include Timeline cue programming with a variety of showcontrol Trigger and Event formats. Powerful multitrack audio playback functions include clip editing, looping, timeslip, mix automation and archiving, plus the object-based delay-pan programming pioneered by TiMax. Also demonstrated will be the new TiMax Tracker Touring Version configuration, which has recently completed a major German arena tour of Peter Maffay’s Tabaluga with PoolGroup GmbH. 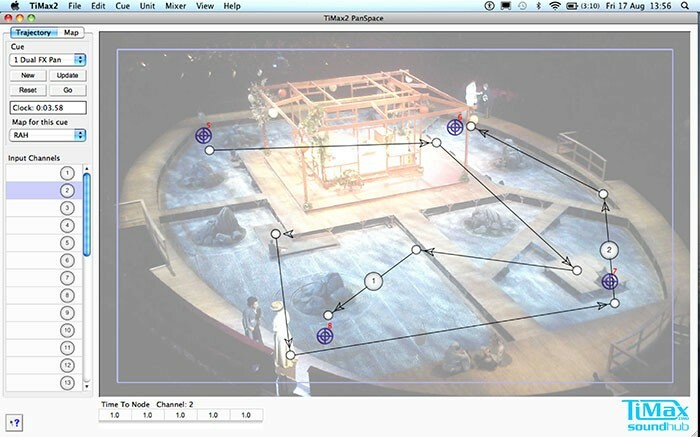 This market-leading performer-tracking system follows actors or presenters to control audio localisation, playback, lighting and media servers. The new Touring Version features fully ruggedized and weatherproofed TT Sensors and rackmount POE Combiner Hub which allows quick and simple installation cabling. TiMax SoundHub is a multichannel system matrix and playback server for theatre and opera sound, live events, AV installations, nightclubs, attractions and museums plus corporate, retail and themed environments. It comprises a scaleable matrix mix engine from 16 to 64 channels in/out with up to 64-tracks of random access audio playback in a single 2U chassis. A powerful feature-set includes linkable and storable input and output parametric EQ, assignable zone level control groups plus dynamic delay-matrixing for realtime audio localisation of performers, presenters, exhibits, signage and attractions, as well as 3D surround sound for effects and music. Simple auto-config plug 'n play networking allows control from multiple PC and Mac clients or touch-panels such as Crestron, AMX or Out Board’s new iPad server app. Options include networking such as MADI, Ethersound, Cobranet and Dante.